There was a time in my life when I was afraid of verse novels. You might even say I avoided them. But then I read Out of the Dust by Karen Hesse, and I was completely won over by this format of novel-writing. I wish I could remember what inspired me to read it in the first place because whatever (or whoever) it was deserves a lot of credit. 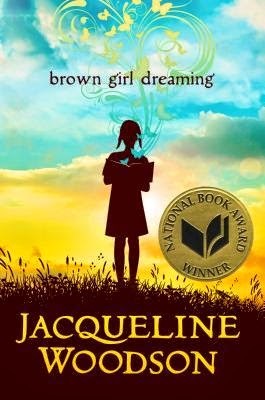 So when I saw all the attention Brown Girl Dreaming was getting on Newbery 2015 lists and found out it was also a verse novel, I ran to get my hands on a copy (which is fairly difficult to do when you're #78 on a library wait list). For years, I have counted Out of the Dust among my very favorite books, but Brown Girl Dreaming is threatening its position. I definitely enjoyed it, and some of the poems moved past just being enjoyable and truly touched me. Jacqueline Woodson grew up in the 1960's (yes, it's a memoir in verse). Since part of that growing up takes place in South Carolina, you can imagine that the Civil Rights movement is an important component of the story. But it's also just about the happenings, both tragic and heartwarming, that make up this thing we call life. At its heart, however, it's about Jacqueline's journey to becoming a writer, which after reading her beautifully flowing verse, you'll be surprised there was ever a time when it didn't come easily to her. I've read my share of books (fiction and nonfiction) that explore Civil Rights issues, but that poem hit me hard and fast in a new way. In a mere seven lines, it shows how stamping out the sins of the past isn't as quick and easy as painting over a sign. The prejudices linger and hearts continue to hurt. I think it's partly the genre itself (the line breaks, the formatting on the page, the words that are said and unsaid) that is able to nudge those familiar emotions and feelings in a new way, but I was continually impressed with Jacqueline Woodson's imagery and voice, which seemed completely her own (but, like I said, I definitely need to explore this genre further to see if I'm just a sucker for anything written in verse). The thing I love about a book like this is that, when taken as a whole, it creates a beautifully complete story, but I can also open the book at random and read a poem here, turn a few pages and read another poem there, and each one is enjoyable and complete in and of itself. It's one of the books that's going on my Christmas list this year, in part because I know that it will give something new to me every time I pick it up, whether I have time for just one or two pages or the entire thing. One of my very favorite individual poems was called "Other People's Memory," which talks about how everyone in the family remembers Jacqueline's birth as happening at a different time of day. Grandma Georgiana swears it happened in the morning, but Jacqueline's mother says it took place in the afternoon, and Jacqueline's father says she was born when it was almost night. I wanted to share an excerpt here, but I couldn't narrow it down to one stanza. It just didn't have the same impact when separated from the rest. I read most of this book on the 14-hour plane ride to Australia. By the end, in my nearly delirious state, my own thoughts were coming in short, clipped phrases, so I thought, Hey, I'm going to write a poem about what it's like to be on this jet for fourteen hours--a gripping subject to be sure, but one that (luckily for you) I won't be sharing here. I think that's really what Jacqueline Woodson set out to do with all the poems preceding this one--capture and share the "one day"s and the "someday"s, but most of all those "perfect moment"s that makes up the present.